We hear an undulating, squeaking sound from within the spruce forest. We move slowly towards the sound, and a large grey shadow comes out of nowhere and swoops by. At the same time, the sound increases in volume. 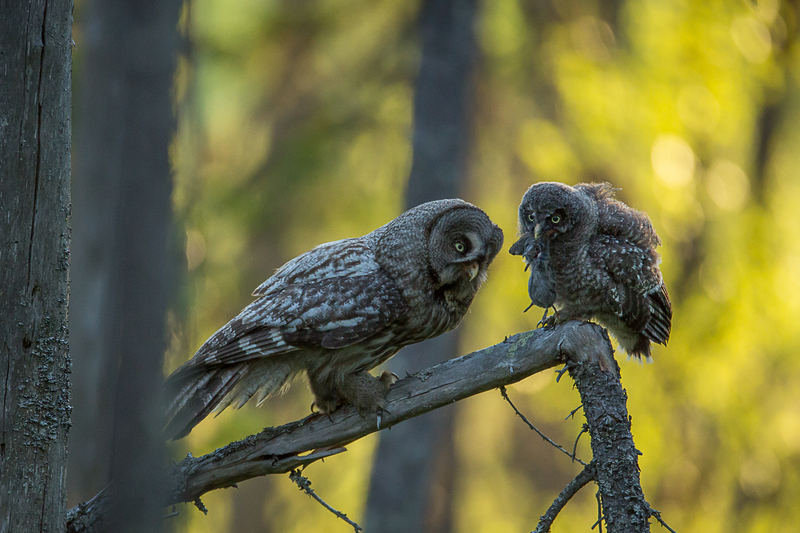 The male Great Grey Owl just brought a vole, and the fledglings are trying to compete for the prey. 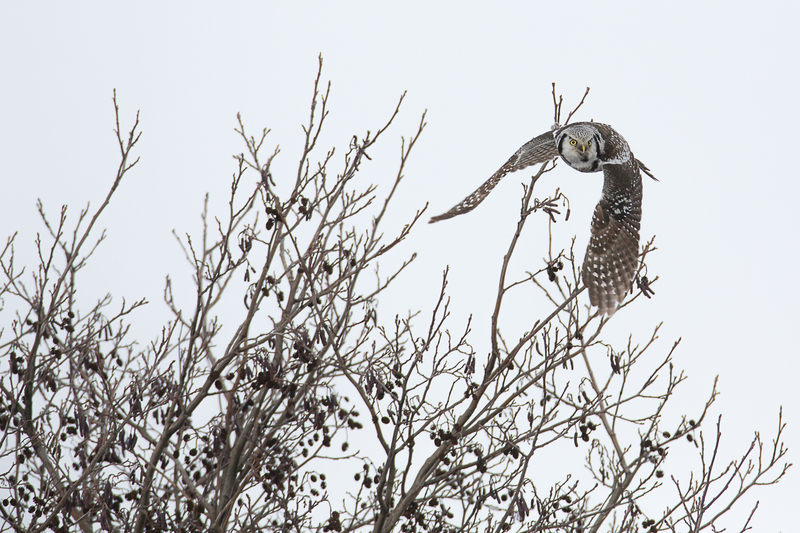 The vole is handed over swiftly, and the owl glides off in search for more food. We are well hidden behind a spruce, but with good photo opportunities, and await the next delivery. Nocturnal owls have always fascinated humans, and there are many folk-tales associated with them, from wisdom to death. Some of the more interesting species occur in northern Sweden, e.g. 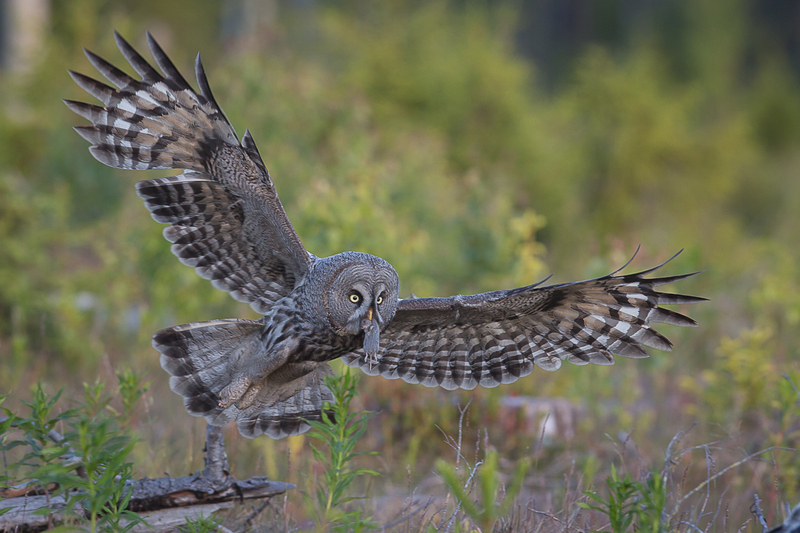 one of the worlds’ largest owls – the Great Grey Owl. 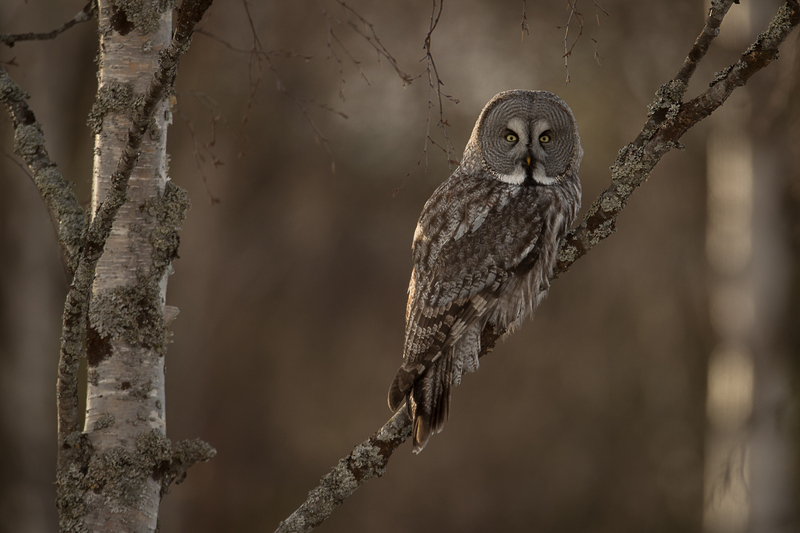 This workshop concentrates on photographing the northern specialities – the Great Grey Owl, the Ural Owl and Hawk Owl. 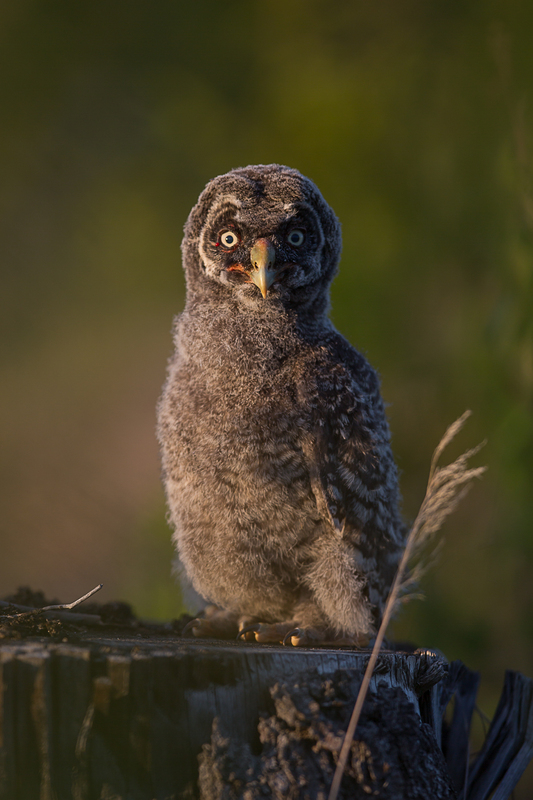 The owls’ breeding success varies from year to year depending on variations in the availability of their main food source – rodents. During a poor year, we cannot guarantee that all three species can be photographed. 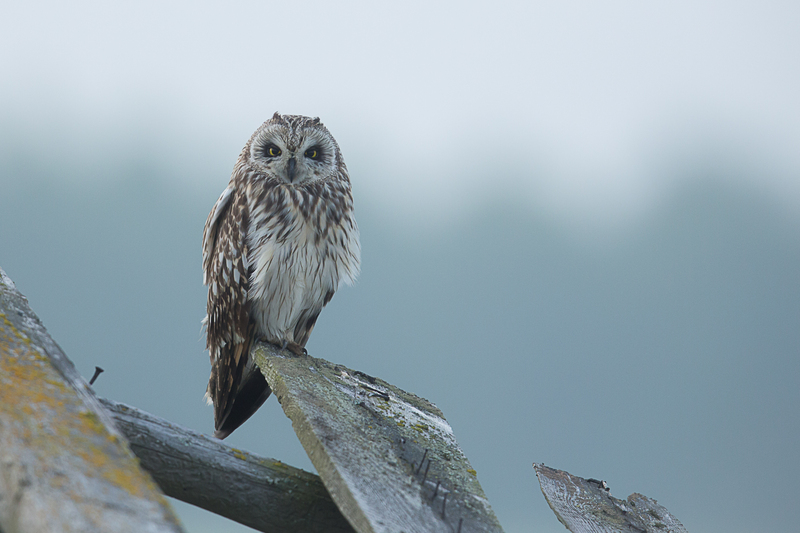 However, during a good year, we might also be able to photograph the Short-eared Owl and Tengmalms Owl. 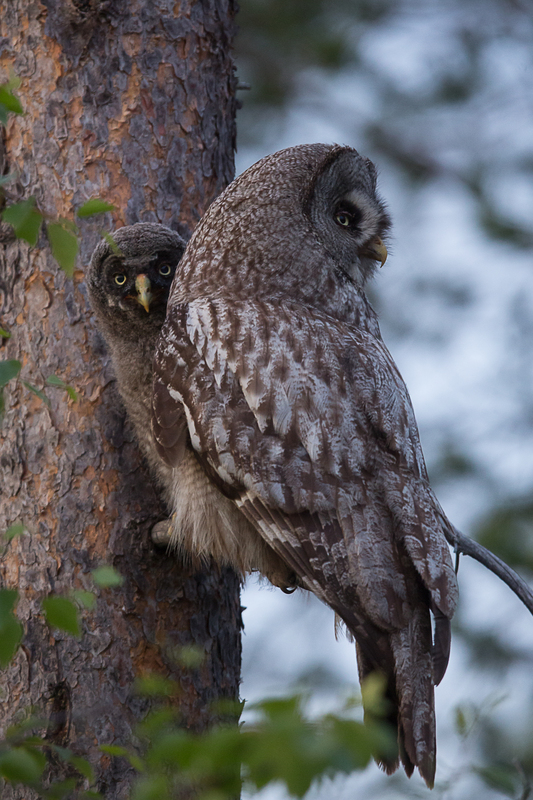 Owls are not usually shy, bur might become aggressive if we don’t behave correctly around them. Some species can attack humans if they approach nests at egg-laying time, or when the young have just hatched. In order to avoid disturbing the owls and putting ourselves at risk, we hold the workshop when the young have just left the nest. Then, they tend to linger round the nesting-site, and the adult birds are tolerant. Naturally, we do not want to disturb the birds, and if they show any signs of stress, we will leave the site. 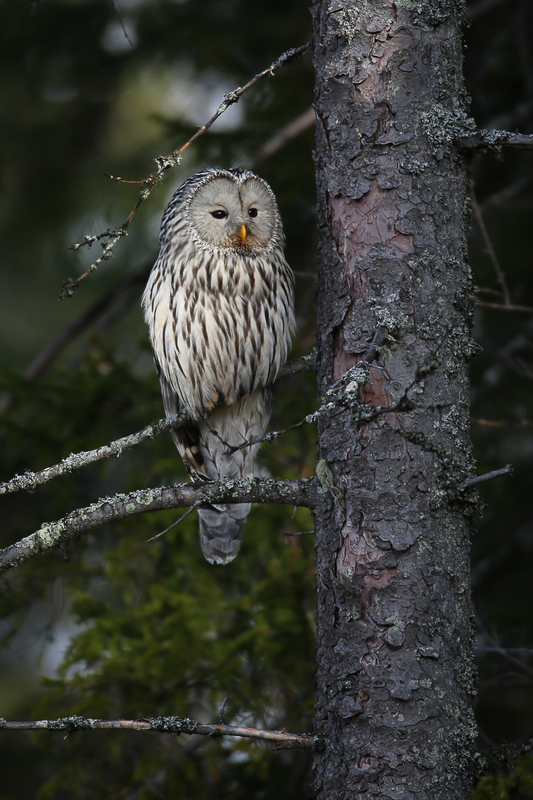 We work together with a very knowledgeable local guide, who will survey the known owls in the area, and also look for newcomers, in order to give us the best possible photography conditions. 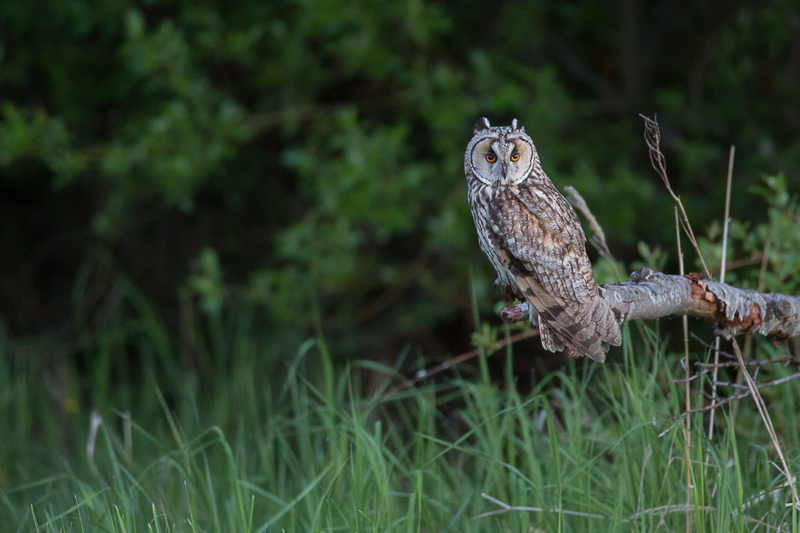 However, to get good images of owls, we need patience and time. Our workshop is held during the best time of year, and this far north there is daylight almost 24 hours a day. 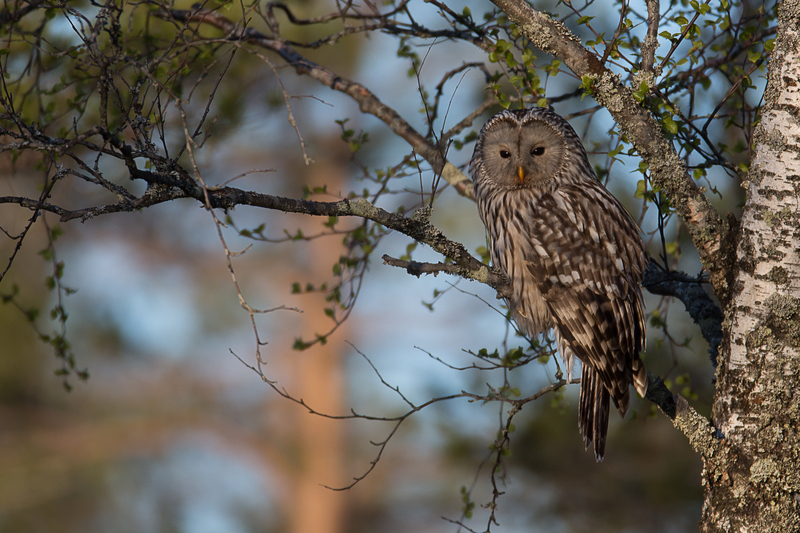 If you would like to experience som of the Nordic countries’ more characteristic bird species and take the challenge of photographing owls, this is a workshop for you. Share in double room and meals according to itinerary. Photo workshops, local transports, transfer to and from Umeå airport. Limited availability of single rooms. Please contact us for more information. Flights in and out of Umeå airport, tips, insurance, cancellation insurance, beverages, meals that are not specified in itinerary, phone and internet charges, personal items. Umeå airport. The tour starts and ends here. 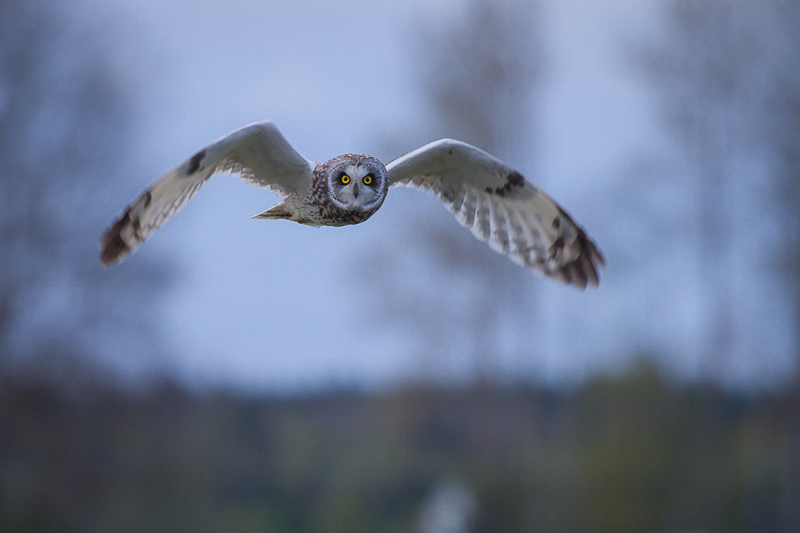 The main focus on this tour is to photograph owls. We will be able to move around in the forest while photographing, but since we need to keep a distance to the owls so we don’t disturb them it is good to bring telephoto lenses. We will be photographing all times of the day so it is good to bring lenses with aperture 2,8 and 4,0.Zoom lenses like 70-200mm and 80-400mm gives you great possibilities to take different images of the birds. To increase focal length you can use a teleconverter. If you have two camera bodies, bring both in order not to have to change lenses as much. Tripods will be useful so do bring one. Temperature in northern Sweden in June can be very pleasant during daytime but the nights can still be cold. It´s important to bring warm clothes. Pair of rubber boots or sturdy hiking boots are the best option for the feeds. Our tours are open to all nationalities, so the group may be international. Our tour leaders speak Swedish and English. Registration fee to be paid on registration. Remaining fees to be paid latest 60 days before the tour starts. Contact your insurance company about insurance, including cancellation insurance. Contact your doctor about vaccination requirements. Arrive at Umeå airport in the morning, and transfer to our accommodation. We settle in before having a workshop and information about the coming days. After dinner we go on our first photo session. During these days we will concentrate entirely on photographing owls. This means that we spend as much time as possible in the forest, in order to get the best out of our stay. The outcome of the nesting season will determine exactly where we go. After Breakfast we leave for Umeå airport, and the journey home. NOTE! When you have made your booking you will immediately get a confirmation e-mail. If you don´t get the confirmation e-mail please check your spam e-mails or contact us by telephone, +46730 662 007. Yes No – I agree with that my contact information is shared to the other participants on the tour. All correspondence will by via e-mail if nothing else is specified by customer.